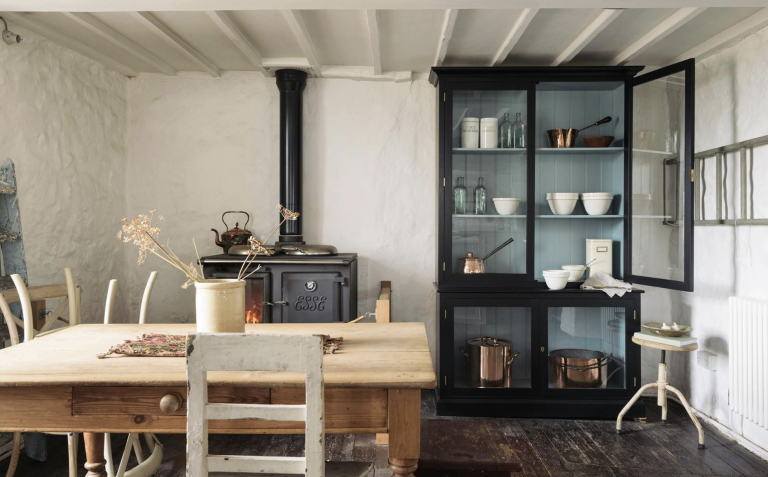 Whether you're renovating a quaint Victorian cottage or Medieval manor house, a classic country kitchen is on the wish list for many people that live in a period house, thanks to the appeal of being warmed by the heat of a range cooker, as well as the prospect of characterful original features and rustic ceiling beams. In fact, country kitchens are so popular that many homeowners take elements of the style and put them into their urban homes. Use our guide to how to design a country kitchen for practical advice and then find plenty of inspiration with our country kitchen design ideas. This country kitchen in a 17th-century farmer's cottage still boasts the cottage’s original stone floor tiles and blackened wooden beams. A practical modern range sits where the original stove would have been, and clever storage and design makes the most of the small space. Use our guide to how to buy a range cooker to find the best model for your home, then browse our pick of the best range cookers. This small country cottage kitchen has cleverly used an old butcher’s block as its centrepiece and kitchen island, which also serves to divide the cooking and dining areas of the room. The decorative scheme is a pretty combination of neutrals and ditsy floral patterns. Use our guide to how to design a small kitchen for more ideas to make your small cottage kitchen feel larger. One of the main draws of a country kitchen are the gorgeous original features that often accompany this style of property. You'll want to ensure that original oak beams and wood flooring are in the best condition possible – use our guides to repairing or replacing timber beams and how to repair wooden floorboards for practical advice – as this will form the basis for the rest of your scheme. In terms of creating an authentic look throughout the rest of your scheme, you might consider painting the kitchen cabinets. Pick a wall colour to tone for a restful look, and choose a cool shade to contrast with the warmth of natural wood. The country kitchen in this restored cob longhouse makes the best use of a long, thin space with limited natural light (as is characteristic to many country kitchens). The soft blue colour scheme creates a complementary contrast with the warmth of the original floor tiles and carpentry, while brightening what might otherwise be a dark feeling kitchen. Painted in a stylish grey and with a combination of granite and wooden worktops, this country farmhouse kitchen is given a contemporary edge, without sacrificing the cottage look entirely. It's full of charm and makes the perfect, welcoming hub for a family home. Making the most of storage potential, a convenient crockery drying rack hangs above the double butler’s sink, with cupboard free walls preventing the space from feeling boxed in. Find more inspiration with our farmhouse kitchen design ideas brimming with character. Mixing eclectic fitted and freestanding furniture creates an authentic feeling cottage kitchen with timeless appeal. To achieve a similar look, you'll want to scour the offerings of salvage yards and antiques shops, while bearing bespoke options in mind, too. Never underestimate the power of paint if you're looking for a budget friendly way to update a tired cottage kitchen. Pairing a cool, duck-egg shade with a deep, navy Aga and rustic furniture for spring-inspired interior. Painting old kitchen cabinets is easier than you might imagine, use our guide to how to paint kitchen cabinets for step-by-step instructions. If your cottage kitchen is lacking natural light or you're simply looking for easily achieved, space-enhancing effects, consider opting for a timeless white (or off-white) scheme. Accessorise with natural materials – you can't go wrong with wood – and other neutral coloured features to retain the feeling of a calm environment. Tempted by white? Browse more of our white kitchen design ideas. In addition to making what can be a dark space feel lighter and brighter, a neutral scheme is a timeless option that promises not to date as interiors trends come and go. White also makes the perfect canvas for a space filled with stunning original features – we can't get enough of these stand-out timber beams. Muted colours are another option worth considering if you're looking for cottage kitchen design ideas. Paired with classic touches such as brass taps and butler’s sink salvaged during the renovation of the house, these muted green kitchen cabinets have a distinct air of Cotswolds elegance about them. Replicate this look using the shade Lichen from Farrow & Ball. Find out more about designing a Shaker style kitchen, too. Love the fashion for dark kitchens? You needn't worry about embracing the trend in a traditional home, but if it's low-ceilinged, be sure to pick out light, reflective colours for the rest of the room – from flooring finishes to paint to furniture and worktops. Be inspired by these dark and dramatic kitchen design ideas. The ideal way to create a laid back look in any kitchen – cottage or otherwise – is to choose non-matching pieces. Here, handmade drawers and cabinets combine with salvaged finds and open shelving for a charming, relaxed finish that's so easy to live with. A lime-effect light blue ceiling further enhances the eclectic feel of this cottage kitchen. A country kitchen isn't complete without antique and reclaimed finds which will instantly add character to the space and give it that lived-in feel that so many of us crave in a cottage kitchen. So, if your kitchen cabinetry is brand new, in fact, especially if it's brand new, add in some handpicked, pre-loved pieces to give the whole room a characterful boost. In a traditional country kitchen, nothing would have been neatly stashed away in cupboards and cabinets, whatever was useful would have been to hand. If you're looking to create a space with a lived-in feel, aspire to this authentic storage system, but curate the pieces you display so that only your best utensils, pottery, pans... whatever are on show. Find inspiration for displaying your favourite pieces in our design gallery. The ultimate addition to a cosy country kitchen is a woodburning stove to warm the space. Perfect for cold winter mornings and evenings sat sipping tea around the kitchen table, woodburning stoves create a comforting focal point that you won't regret investing in. Use our essential guide to choosing a stove to ensure you pick the right model for your home, then browse out pick of the best stoves: woodburning and multi-fuel. Looking for more cottage kitchen advice and inspiration?